Spanakopita Crescents Recipe is a short cut to the traditional Greek Appetizer that takes much longer to make. Once again it is time for Secret Recipe Club reveal. So fun to go through other food blogs and find a recipe to try. Even more exciting is to see what others thought was an interesting recipe to try off my blog. For those of you new to this club concept, each month we are assigned another blog and secretly find a recipe post that we would like to try and then reveal our experience with their recipe. I was matched up with Flavors by Four, which I think is a family of foodies who share their recipes together on one blog. Please correct me if I am wrong. I love love love Greek food and often visit our local greek restaurant. My favorite thing on a greek menu is the spanakopita. I had a friend who used to make these and she moved away before I got my private cooking lesson on making spanakopita. 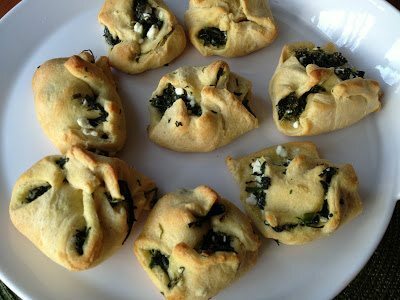 I was thrilled to find Flavors by Four’s simple version, Spanakopita Crescents REcipe I decided to make them as an appetizer before our pasta but we have eaten spanakopita as a main dish too.! Filled with delicious spinach and feta combination you can’t go wrong. It is an easy recipe and but has all the yummy flavor of the traditional spanakopita. Getting the filling put together. Roll out 2 triangles together and then cut into squares. Took a little to figure this out. Not as pretty as Flavors by Four but just as tasty. Usually crescent rolls don’t last the next day, but I simply microwaved the sings leftover one for 25 seconds and had for lunch the next day. Wish I had more to eat!! Thanks for a great recipe. In a medium bowl, add feta cheese and dill and set aside. In a medium saucepan, heat olive oil on medium heat and add onions and garlic and saute for 3 minutes. Drain as much liquid out of the spinach as you can by either using a sieve or pressing the water out with your hands or a spoon. Add defrosted and drained spinach to the pan and mix the garlic, onions, and spinach together. Once blended well, add feta cheese and dill to mixture. Next add lemon juice and mix everything together. Place crescents rolls on clean surface (do not separate triangles) and cut a pair of triangles in half. Add one tablespoon of spinach mixture to each roll. Fold over topping and pinch all openings closed. Place rolls on ungreased cookie sheet. Bake for 12-14 minutes or until rolls are golden brown. Serve warm. 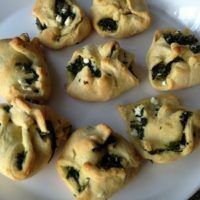 What do you think of these short cut Spanakopita Crescents Recipe?? Made this tonight. It was awesome and super quick and veggie rich. I am so glad you liked them, I know I can’t take credit for the recipe but so glad I picked it out. These look great! I’ll definitely try them out! Ooh yum–love the flavors in spanikopita! This looks delicious! What a pretty appetizer too! Those look delicious – and like they are fun to eat, too!! What a great choice!! I love spanikopita – what a great twist on it. I have never made this before, you’ve inspired me to give it a try! Delicious and beautiful. YUM! Feta and spinache. I am sold. YUM!! I’m saving that recipe!! I have never had Spanokopita, but now I’m sure I will! Love spinach and feta – I think that God just made them to go together. And yours IS beautiful! Very tempting! I am totally making these. Thanks. Those would be a blast to try! I think my husband would love those! Your Spanakopita looks wonderful, we will just love these special treats. Thanks for sharing this awesome recipe. Looks and sounds amazing! I have been getting so many great recipes from your blog-thanks! They sound super easy and like a great appetizer for a party…good SRC choice! These looks so tasty and a quick recipe for appetizers for a party. Great SRC choice! I LOVE spanikopita and this is a perfect quick version. Thanks for sharing!